A security that tracks an index, a commodity or a basket of assets like an index fund, but trades like a stock on an exchange, thus experiencing price changes throughout the day as it is bought and sold. A privilege sold by one party to another that offers the buyer the right, but not the obligation, to buy (call) or sell (put) a security at an agreed-upon price (strike price) during a certain period of time or on a specific date. Options are extremely versatile securities that can be used in many different ways. Traders use options to speculate, which is a relatively risky practice, while hedgers use options to reduce the risk of holding an asset. Naked calls increase in value as the underlying stock increases in value. Likewise naked puts increase in value as the underlying stock decreases in value. Buying both a naked call and a naked put means that if the underlying stock moves up the call increases in value and likewise if the underlying stock moves down the put increases in value. The combined position can increase in value if the stock moves in either direction. The position loses money if the stock stays at the same price or within a range of the price when the position was established. This strategy is called a straddle. It is one of many options strategies that investors can employ. Options strategies can favor movements in the underlying stock that are bullish, bearish or neutral. Taipan Financial News’ Smart Investing host Sandy Franks gets ETF trader Rick Pendergraft’s advice on profitable ETF investing. The power of options lies in their versatility. They give you the power the adjust your position according to the present situation. However just like any other security, options have their own set of problems. Options are complex securities and can be sometimes extremely risky. 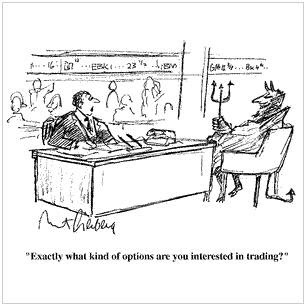 Option trading is therefore not for everyone. However before you decide not to trade in options, you should atleast understand them. Not learning how options function is as dangerous as jumping right in it. Option is nothing but a contract that gives the buyer the right to buy/sell an asset at a specific price on/before a certain date. So what is the big deal about that ? The big deal is that the buyer is not obliged to buy/sell. Now that sounds interesting….isnt it ? Investopedia gives an excellent example. Say, that you discover a house that you’d love to purchase. Unfortunately, you won’t have the cash to buy it for another three months. You talk to the owner and negotiate a deal that gives you an option to buy the house in three months for a price of $200,000. The owner agrees, but for this option, you pay a price of $3,000. It’s discovered that the house is actually the true birthplace of Elvis! As a result, the market value of the house skyrockets to $1 million. Because the owner sold you the option, he is obligated to sell you the house for $200,000. In the end, you stand to make a profit of $797,000 ($1 million – $200,000 – $3,000). While touring the house, you discover not only that the walls are chock-full of asbestos, furthermore, a family of super-intelligent rats have built a fortress in the basement. Though you originally thought you had found the house of your dreams, you now consider it worthless. On the upside, because you bought an option, you are under no obligation to go through with the sale. Of course, you still lose the $3,000 price of the option. A call gives the holder the right to buy an asset at a certain price within a specific period of time. Buyers of calls hope that the stock will increase substantially before the option expires. A put gives the holder the right to sell an asset at a certain price within a specific period of time. Buyers of puts hope that the price of the stock will fall before the option expires. People who buy options are called holders and those who sell options are called writers. Holders have the right to buy/sell but are not obligated. Writers are however obligated to buy/sell. This makes selling options more complicated and even riskier. Why Investors use Options ? Investors use options to both speculate and to hedge risk. Speculation in nothing but betting on the movement of a security. The advantage of options is that due to their versatility you can make money even when the market is crashing. Think of hedging as an insurance policy. Just as you insure your house or car, options can be used to insure your investments against a downturn. There are two main types of options. American options can be exercised at any time between the date of purchase and the expiration date. European options can only be exercised at the end of their lives. Conclusion: Options adds another item in your investing toolbox which also gives you insight into the workings of some of the world’s largest corporations. With online brokerages providing direct access to the options markets, the average investor now has the ability to use the most powerful tool in the investment industry just like the pros do. However options aren’t for everyone. Options can be alot more dangerous if you don’t educate yourself before using them. 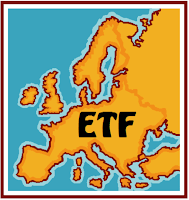 ETF: Something for those lazy investors !! Lets face it. Stocks is not for everyone. Alot of research has to be done before you indulge yourself into buying a stock. You need to go over the fundamental and the technical analysis. What is the EPS, P/E, PEG, Market Cap, Dividend, ROC, MACD…the list is end. Obviously you dont have to be a rocket scientist to buy stocks, but without the research it would be pure gambling. Think of an ETF as a mutual fund that trades like a stock thus experiencing price changes throughout the day as it is bought and sold. You can short sell them or buy them on margin as well. ETF tracks an index, a commodity or an index fund. ETFs offer diversification, high trading flexibility, low expense ratio and tax efficiency in a flexible investment. An ETF does not have its net asset value (NAV) calculated every day like a mutual fund does. When buying and selling ETFs, you have to pay the same commission to your broker that you’d pay on any regular order. The first exchange-traded fund was the S&P 500 index fund. There are hundreds of ETFs trading on the open market ranging from sector-specific, country-specific and broad-market indexes. You can pretty much find an ETF for just about any kind of sector of the market. If you are interested in the healthcare sector, Vanguard’s Health Care Viper VHT would be worth looking into. If you’d like exposure to the internet infrastructure sector, then maybe Internet Infrastructure HOLDRS IIH might be for you. As the name suggests, this EFT consists of the 100 largest and most actively traded non-financial stocks on the Nasdaq. QQQQ offers broad exposure to the tech sector. Because it curbs the risk that comes with investing in individual stocks, the QQQQ is a great way to invest in the long-term prospects of the technology industry. Imagine trying to buy all 500 stocks in the S&P 500. How crazy that would be ? SPDRs allow individual investors to own the index’s stocks in a cost-effective manner. You can trade the S&P Index 500 (SPY) on the AMEX. Another nice feature of SPDRs is that they divide various sectors of the S&P 500 stocks and sell them as separate ETFs. Here is the list of ETFs for various sectors. The energy sector SPDR index XLE invests in industries, such as energy equipment and services, and oil and gas services, among others. The technology sector SPDR index XLK invests in industries, such as communications equipment, computers and peripherals, electronic equipment and instruments, telecommunication services, semiconductor equipment and products, information services, Internet software and services and software, office electronics. iShares is Barclay’s brand of ETFs. Barclay has put out a number of technology-oriented iShares that follow Goldman Sachs’s technology indexes trading on the AMEX. VIPERs are Vanguard’s brand of EFTs. Vanguard also offers ETFs for many different areas of the market including the financial, healthcare and utilities sectors. Diamonds Trust DIA tracks the Dow Jones Industrial Average. The fund is structured as a unit investment trust. A great reason to consider ETFs is that they simplify index and sector investing in a way that is easy to understand. If you feel a sector is going to do well in the near future, go buy it. If however, you think that a sector is going to slump, go short it. The combination of diversification, low cost, tax efficient and the flexibility that ETFs offer, makes them attractive trading options. They are easy to understand and easy to use, and they are gaining in popularity at such a rapid pace that some experts anticipate that they will one day surpass the popularity of mutual funds. If ETFs haven’t found a place in your portfolio yet, there is a pretty good chance that they will in the future. You can also view a small video explaining ETFs. If only you knew when !!! Should we trust these analyst ? Which sector are you in ? ?